Welcome USCIS Director Alejandro Mayorkas! Hello from the SF External Stakeholder Meeting with USCIS Director Alejandro Mayorkas. My fellow teacher from Milpitas Adult School, Judy Connell, and I attended a stakehholder meeting drawn from the immigration law and citizenship education communities. Director Mayorkas had just come from a general meeting of USCIS employees, during which they discussed their concerns with immigration and naturalization policies, procedures, and budget issues. 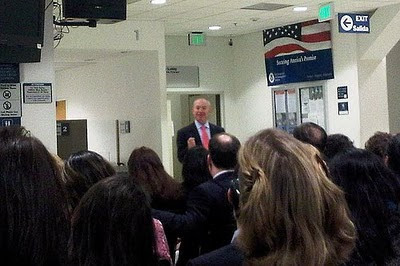 After such a lively meeting, many high-level would pass on meeting with the outside community, however Director Mayorkas seemed to be energized by his meeting with the USCIS employees, and seemed to be genuinely delighted to hear from the "external stakeholders" who work with the immigrant communities. Director Mayorkas opened with a brief childhood story about visiting his Cuban granddparents in New York. He ate a sandwich they offered, and the tossed away the paper. He then watched his grandmother retrieve the wax paper, carefully smoothed it out, to be used again. He made the connection between government waste and how it effects the immigrant community--the USCIS "cases" are real lives of real people. The immigration lawyers in the audience, heartened by Director Mayorkas' epression of sympathy, talked about cases in which the USCIS could have responded in a more just and compassionate way. The lawyers were especially concerned about marriage and work problems. Director Mayorkas and his associates took notes, commented on the concerns raised by the lawyers, and provided direct email/phone numbers to the specific government officials who could help resolve the case or policy questions. One community organizer said that the immigration fees are too high and pleaded with the Director not to raise the fees. Director Mayorkas said that when he took charge of the USCIS, he was advised to raise fees to maintain their level of service. Director Mayorkas acknowledged that raising fees would be very, very, very difficult for the immigrant community. He has told the USCIS departments to cut costs and is looking for new ways to provide better customer service. He wants the USCIS to save money by cutting their costs before he asks taxpayers--especially immigrant taxpayers--to spend more of their own money. A teacher asked about schools issuing a "Certificate of Citizenship Education." In the past, students who attended Citizenship classes could bring a letter or certificate to their Citizenship Interview stating that they had studied the US History and Government questions, and the USCIS examiner could skip these questions. Director Mayorkas said that he would review this idea. I praised the USCIS for all of the new study materials (Have you seen the new USCIS interview video, yet?). However, the explanations of the 100 questions in the M-638 (The Quick Civics Lessons) was too difficult for advanced ESL students, and that they should be rewritten for ESL Students. I also said that it was difficult for ESL students to find study materials on the USCIS website and perhaps the USCIS Offfice of Citizenship should have a separate website in simple English for all the new study materials like the old WelcometoUSA.gov website. All in all, it was a great meeting. Thanks to Director Mayorkas for addressing our concerns. Thanks to all of the participants at the meeting, especially my fellow teacher from Milpitas Adult School, Judy Connell. Last but not least, special thanks to the USCIS Community Relations Offices, Lucee Rosemarie Fan, for once again making this event happen!